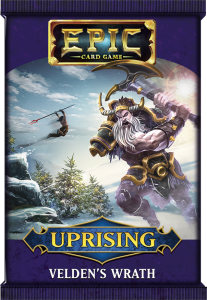 Uprising is a set of four expansion packs for Epic Card Game, each with 13 non-random cards. One of four Epic Uprising Expansion packs for the Epic Card Game. Captain Markus� tyrannical grip on the people of Covenant has sparked an uprising. With the city in chaos, Chamberlain Kark has issued an edict declaring martial law. As the Watch make scores of arrests, popular support for the uprising grows even stronger. Will justice prevail? For years, the wilds around the city of Covenant have been terrorized by the mighty Draka. Now, there are whispers that the tyrannical dragon may have been defeated. This is small comfort to those being burned out of their homes by Draka�s hound, Scarros. With each fiery battle, Scarros� power seems to grow. Will someone defeat him before the wilds are consumed in flame? The mighty Velden has come from the far north. Has this wrathful titan come to fight the forces of Draka and demons of Raxxa, or is he just another one of the mysterious Helion�s puppets? The fairies say he is the one heralded by the mist guides, and they�ve rallied to his banner. As his forces come closer to the city of Covenant, the question looms: hero or villain? With the city of Covenant in the midst of a savage uprising, a dark force is growing in the shadows. Zannos, the Corpse Lord, is using the casualties of the conflict to provide more soldiers for his army of plague zombies. Can the will of Zannos be stopped before it�s too late?